If you are experiencing severe pain that traditional painkillers aren't affecting, you could get short-term relief with Zapain. What are the Uses, Dosage, Side Effects and Warnings? How Do I Take Zapain? How do I store Zapain tablets? Zapain is a brand of co-codamol - an opioid analgesic (painkiller) which is combined with a non-prescription pain reliever (paracetamol) to provide more effective relief than either ingredients alone. "Severe pain, which may come following a severe injury or an operation, requires stronger painkillers than paracetamol alone. Zapain contains two painkillers which work together to provide effective pain relief for patients in these kinds of situations" Mohamed Imran Lakhi, Superintendant Pharmacist. 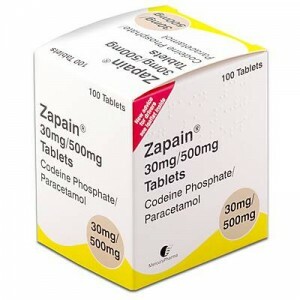 Zapain tablets contains 30 mg of codeine and 500 mg of paracetamol which effectively reduce severe pain. You can buy Zapain online from Prescription Doctor by simply filling in our quick and easy consultation form, which our expert prescriber will review. If you order before 3pm, you could have your pain relief medication the next day. the codeine in Zapain interacts with the central nervous system (CNS) to change the way the brain perceives pain. Zapain works by mimicking the action of pain-reducing chemicals, known as endorphins, which occur naturally in the brain and spinal cord. The human body converts codeine into morphine, another type of opioid. Once converted, the morphine molecules latch onto the opioid receptors in the CNS. When codeine binds with the receptors, they send a pain-reducing message to the brain. Paracetamol works in the central nervous system to relieve mild to moderate pain differently. This medicine inhibits the production of prostaglandins, which are naturally occurring chemicals that produce pain and inflammation at the site of injury or disease. Together, codeine and paracetamol work better to provide pain relief than either medicine could provide alone. All oral pain pills must be digested in the stomach before they begin to work. Patients typically experience relief in 30 to 45 minutes after taking a pill. Zapain is a slow release medication and can provide relief from pain for up to 6 hours. Zapainis commonly used to treat severe pain. Our registered prescribers can determine the correct dosage for you based on the severity of your pain, source of pain and your medical history. If our prescribers determine that Zapain is not a suitable treatment for you, they may offer alternative treatments options. Take the prescribed dose every four to six hours when necessary. If you take more Zapain than prescribed or exceed the maximum quantity, consult a physician immediately even if you feel fine. Taking excessive amount of paracetamol can cause delayed onset liver damage. The risk of paracetamol overdose is greater in those with alcoholic liver disease. If you go to the hospital, ensure you take the remaining tablets in the original packaging so that doctors know exactly what you have taken. Do not take Zapain if you are pregnant unless instructed to do so by your doctor. Do not take Zapain while you are breastfeeding, as the codeine in this product passes into breast milk. Adults should take one or two tablets every four to six hours with a glass of water. Always take Zapain exactly as prescribed by our online prescriber. Check with your prescriber if you are not sure how to take Zapain. Do not take more than two tablets at a time, or take more often than every four hours. Do not take Zapain for more than three days, as the risk of opiate addiction increases with prolonged use. If your pain does not improve after three days on Zapain, consult with your doctor. Zapain is not suitable for children. The metabolism of codeine is unpredictable in children and therefore should be avoided. Keep the medication stored out of sight and reach of children. Do not store in locations where the temperature exceeds 25 degrees Celsius. Store this medication in its original packaging. When you have finished with this medication, ask your pharmacist how to dispose of any unused tablets. To protect the environment, do not dispose of unused medication via household waste or wastewater. You can find the expiry date printed on the package. The expiry date on the package refers to the last day of that month. Do not take the medication after the expiry date. to reduce your risk of drug interactions, tell our prescriber about all the medications you currently take. Inform our prescriber of any medical conditions you may have, as they may change the way Zapain works for you. Zapain contains 500 mg of paracetamol and 30 mg of codeine phosphate hemihydrate. Do not take Zapain if you are allergic or intolerant to any of the ingredients listed within the patient information leaflet. Our company helps you find the pain reliever you need, safely and securely. We offer a private prescription service, and all of our orders are fulfilled by a UK-regulated pharmacy. Is co-codamol the same as Zapain? Co-codamol and Zapain both contain 30 mg of codeine phosphate and 500 mg of paracetamol, and are both intended to treat moderate to severe pain in adults. A person who has trouble swallowing tablets or capsules may choose co-codamol effervescent over zapain. Can I take codeine phosphate and ibuprofen together? While it is generally regarded as safe to take zapain and ibuprofen together, you should always consult your doctor to ensure that no interactions occur while taking both products. Can you drive after taking Zapain? Opioid painkillers can have a lethargic effect which may hinder your alertness and ability to drive. If you feel your concentration affected by the medication you are taking, it is strongly advised not to drive. For more information, check out the laws on drug driving. Prescription Doctor are a specialist online medication service who cater for people who want to buy branded medicine over the internet. All medications are issued by Prescription Doctor following a free confidential assessment, to ensure that the prescription in question is appropriate for you. The assessment is thorough, but we guarantee that personal details will be kept secure. Our in-house customer care team are always on hand to answer any queries. You can also contact one of our doctors via our free online messaging service. What are the uses, dosages, side effects and warnings? Rated 5.0 out of 5 based on reviews. Product Review: Spot on and legit, can’t fault it. Product Review: This product very helpful to me. Service Review: Very happy with service highly recommend Thanks. Service Review: Was worried about bank transfer however this company exceeding my expectations. Updated throughout the whole process via email and chat. Thanks Guys!